The State of Salesforce report quizzed 1500 Salesforce customers, in all kinds of roles, on their usage of the platform. 75% of users said that Salesforce makes it easier to do their jobs while 59% agreed that that it’s easier to use their company’s Salesforce implementation today than it was a year ago. But problems remain. Given that many sales teams are still in a dysfunctional relationship with their CRM, how can they tackle the challenges identified in the report? Here OnePageCRM, we found three trends particularly interesting. Salesforce users spend more time on managing data and reporting than on any other tasks, including actual selling. 70% of Salesforce users have to enter the same data into multiple systems to do their jobs, and 59% say there’s a part of their job that would be easier if they were able to complete it in Salesforce. Brisk brings all the data you need together in one place. It also speeds up logging of sales activity and entering sales data like LinkedIn contacts into Salesforce, letting you spend more time interacting with prospects and customers. Evernote, for example, found that sales staff using Brisk Enterprise handled 170% more Salesforce tasks and updated 84% more Salesforce opportunities. Intercom increased the number of tasks handled by 224%. Despite all the time being spent on data management, 76% of companies struggled with integration and data quality. Poor quality data hinders reporting and forecasting but also impedes companies’ efforts to make greater use of analytics, in which 68% of companies plan to increase their investment over the next year. In fact, the most important goal in respondent’s sales strategies for the next year was increasing the use of predictive analytics (81%). 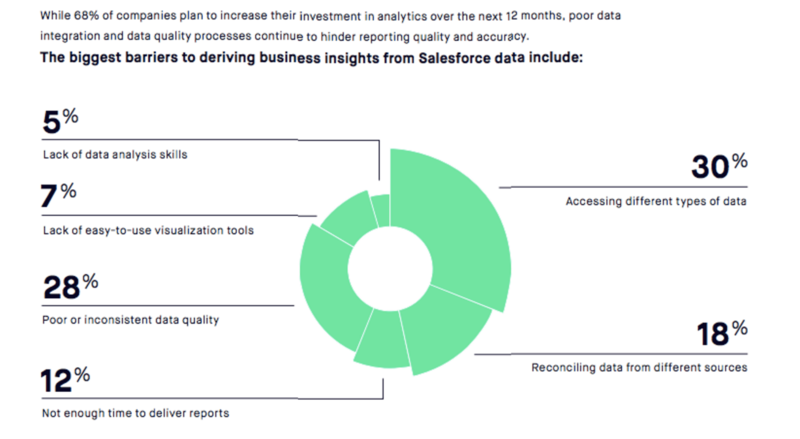 Respondents cited accessing different types of data (30%), poor and inconsistent data quality (28%) and reconciling data from different sources as the biggest barriers to deriving business insights from Salesforce. Brisk increases the accuracy of Salesforce data by prompting sales staff when sales activity needs to be logged, as well as making logging easier. It automatically scans data from multiple sources like gmail, Salesforce and sales and marketing tools such as Marketo, Hubspot and Totango and makes it easy to use analytics by translating them into “to dos” for sales staff. 47% of companies said that improving the user experience of apps used by sales was the most important goal in their sales strategy for the next year. Companies are three times more likely to attribute measurable business outcomes to the use of Salesforce when employees believe that Salesforce makes their jobs easier. 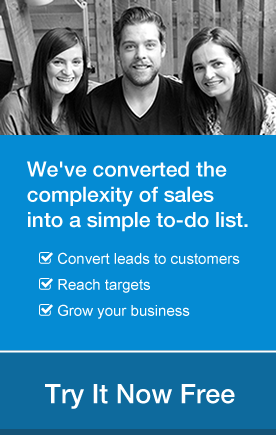 Looking for a proven sales tool to help you close more deals? Sign up for a free 21-day evaluation of OnePageCRM and see how our Next Action Sales method can help you get sales done! At Brisk.io, Madelen was in charge of all aspects of the customer journey, from customer acquisition to onboarding and support.